Home » Posts Tagged "Cake Hat"
May 31 is the date the first La Coupe Salon opened in Montreal. 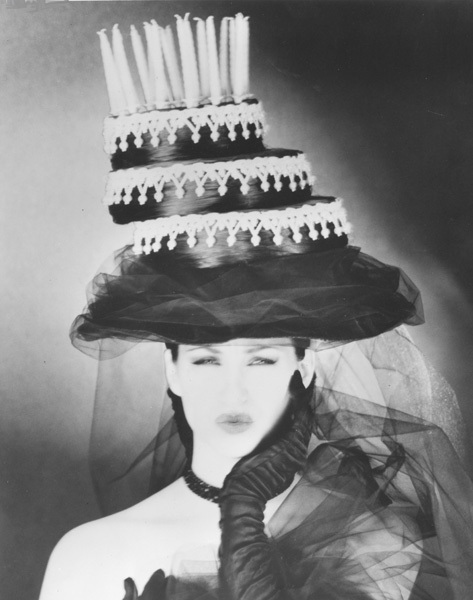 The Cake Hat was created to celebrate La Coupe’s 25 years in business. It was concocted by Renée Cohen using false hair, a hat frame dripping with tulle, cake décor and candles. Charles Booth went on to open another two salons in Montreal, a salon in Toronto, then one in New York City, hair care products and tools. All gone for him now, except for the products. In it’s heyday (the 70s-early 90s) La Coupe was one of the world’s most innovative and leading salons, often considered avant-garde, then, but now the hair seems so wearable, and has stood the test of time, even from the 60s and 70s. Be inspired from then for now, click HairThen on www.helenoppenheim.com then La Coupe.